Your podcast description is one of the first things people see when they come across your podcast online or in a podcast directory. This is your chance to catch their attention and sell them on your show. It’s your opportunity to convince them to listen. Is this show for me? What am I going to get out of listening to this? When a potential audience member comes across your podcast and starts reading your description, they’re wondering, “What’s in it for me?” This is your chance to tell them why they should care about your show. Otherwise, they won’t. I’m joined this week by Cory Miller. Cory is the co-host of the excellent Invisible Details podcast, and Director of Member Success here at seanwes. 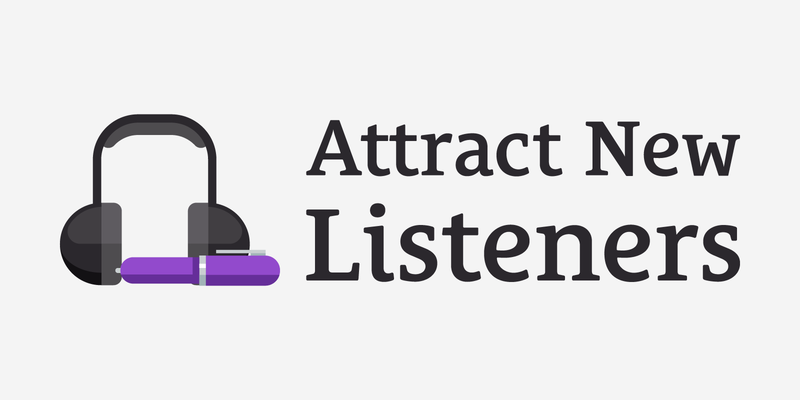 Your podcast description is your chance to tell people what’s in it for them. Refine the goal of your podcast down to a single sentence. Write your description in a way that brings agreement from your intended audience. Don’t make your description all about you, make it about your listener. Your description should resonate with the listener and give them a glimpse of the person they’re going to become after listening. People will only care about you once you’ve proven you care about them. Your description is there to let people know you have what they’re looking for. Write in a simple way that’s tangible and clear for your audience. Deliver complex ideas simply. In your social media descriptions, write something that will help push you toward your goals. Your social media bio is a chance to convince people they’ll get something out of following you. 04:03 Cory: I’m Cory Miller and I’m passionate about helping people make a positive impact in other people’s lives. I run a podcast called Invisible Details, which is a weekly show about building a successful brand through story and authenticity. I also work with Aaron at seanwes as the Director of Member Success. I want people to have a positive experience with the seanwes brand, so I work in the experience department, primarily with members, but also with customers and anyone who interacts with the seanwes brand. 05:19 Aaron: Thanks for joining me today, Cory. When a potential audience member comes across your podcast or video and starts reading your description, all they’re thinking about is, “What’s in this for me? What am I going to get out of this?” Do you find yourself doing that when you’re checking things out? 05:42 Cory: Absolutely. I do that because, in that moment, I’m in the process of evaluating two things. One, do I want the content of this podcast, article, movie, or video in my life? Do I want to be consuming that? Secondly, if I do, is it worth the amount of time that they’re asking me to listen to it? Am I going to get something out of it that’s worth the time I’m going to invest? 06:16 If I’m looking at something and think, “I do want this in my life,” but it’s a daily two hour podcast, then there’s no way I’m ever going to catch up on that and I won’t listen. Whether they acknowledge it or not, people are constantly evaluating if this is something they want in their life and if it’s worth the investment of time or money. 06:48 Aaron: This episode isn’t exactly about episode descriptions, it’s more about the description of your overall podcast, but the same principles apply to episode descriptions too. You’re kidding yourself if you think people are just going to click play on your podcast every single week without reading the title or episode description. 07:18 In this world where there’s millions of pieces of content competing for our attention, your audience is looking to see if your content solves a specific need they have. You have to put thought not just into your podcast description, but into each of your episode descriptions as well. When a potential listener comes across your podcast for the first time, they’re reading the description and wondering, “What’s in this for me?” Your podcast description is your chance to tell people what’s in it for them. You have to tell them why they should care about your show, otherwise they’re not going to. What Should My Podcast Description Say? What is your goal with this show? What are you going to teach or share with your listeners? Are you going to interview people? Coaching, becoming a better person, losing weight & getting fit, podcasting, branding, making videos—whatever your show is about, are you going to bring people from that community in to share what they’ve learned, or is your show strictly about entertainment? 08:44 The last two weeks I interviewed two guys who run a company called Dead Signals and produce two radio drama style podcasts (Related: e064 Creating a Radio Drama Podcast Part 1 (With Writer Marc Sollinger) & e065 Creating a Radio Drama Podcast Part 2 (With Producer/Engineer Dan Powell)). Their podcasts are very much just entertaining stories. They’re not business related and they’re not trying to change the world with their podcasts, they just want to tell stories in the audio medium and entertain people. The way I write a description for my podcast is going to be way different from the way they write. They thought about that and asked, “What are people who would be interested in our show looking for?” They’re trying to write a description that would catch the attention of someone looking for an entertaining story. 09:33 I love the description for their Archive 81 show: “Three months ago Daniel Powell vanished. These are the tapes he sent to me. If you know anything, please contact me at archive81podcast@gmail.com.” They don’t even tell you who the guy is, all you need to know is this guy vanished after he sent a friend some tapes. 10:52 Cory: There are two aspects you’re talking about that are really important to pull out. Write your description in a way that brings agreement from your intended audience. Write it in a way that, while they’re reading the description, they’re thinking, “Oh yeah. Yes! This! Exactly that! Yes! I need to listen to this.” That’s the reaction you’re looking for. 11:38 You want to write your description in a way that brings agreement from your intended audience. When they look at that description from Archive 81, people are like, “Whoa. That’s creepy. I feel like I need to listen to this because I’m intrigued.” You’re bringing intrigue and agreement. Whatever it is you write, you want it to resonate with your intended audience. The second thing is to write it in a way that if they’re sitting with their phone on a bus heading to work and someone looks over and says, “I see you’re listening to a podcast, what’s that all about?” they can respond without looking up the description. 12:38 That’s what you’re aiming for: you want something they can quickly tell their friend about without looking at the description. It’s about clarity. It’s not all about you, it’s about what they’re getting. If they said, “I’m listening to this show where this guy wants to help make me a better podcaster,” that’s huge. 13:03 Or, “I’m listening to this show where they teach me how to build a better brand.” That’s very simplistic, but you can build off that and you can craft a description where people can pass that on. That’s rooted in telling people what the mission of your company, your brand, or your life is. Being able to distill it in a way that allows people to be able to pass it back and forth is very powerful. 13:41 Aaron: Sean McCabe recently rewrote the description for the seanwes business into something very simple and easy to pass on—we teach people how to build and grow audience-driven businesses. That’s a lot easier than it used to be. It used to be a lot of things, and those were great things, but it wasn’t as concise and clear what the goal of seanwes was. Now, if someone says, “What is seanwes?” we can say, “We help people build and grow audience-driven businesses,” and that’s easy to understand. 16:29 Cory: There’s aspects of that you can include in your description. Instead of saying, “Hey, these are all of my accomplishments,” you can change that to something like, “Get knowledge from a guy who has years of experience in podcast editing.” You’re putting the emphasis back on the listener and what they’ll get from the show. 17:24 You can do fill-in-the-blank stuff, like “Learn how to [fill in the blank].” “Get knowledge from 10 years of experience in [fill in the blank].” “If you’re an X, Y, or Z, you’ll get tangible insights on [fill in the blank].” These are actionable steps. Your description should resonate with the listener, tell them what the benefit is for them, and give them a glimpse of the person they’re going to become after listening. Ultimately, you have to remember that people will only care about you once you’ve proven you care about them. 18:35 In regards to a value-exchange like this, you have to prove that you care about this person before they’re going to start caring about you. If I look up a podcast description, I don’t know this person, I have no connection with them, I have no background on them, so I’m looking to see if this is worth my time. Once I listen to it, I can create a connection. That’s exactly how it happened with seanwes. I started listening to the seanwes podcast out of the blue and I didn’t know who Sean and Ben were, but after listening to so many of their shows, I started really connecting with these guys. 19:18 That’s why I joined the Community in the beginning, because they were talking about all these conversations people were having and I had total FOMO. I wanted to be in on the inside jokes because I felt connected to the podcast hosts. The connectedness happens after you’ve proven that you’re here to deliver value. You deliver value first and the connectedness is all about, in a sense, selling yourself, your knowledge, and the benefit to the listener, and then they can continue to connect with you. 20:12 Aaron: Make your podcast description about your listener. If you don’t know who you’re creating a podcast for, that’s a problem. If you’re just creating a show because you want it to be out there, you might get a few people listening, but you need to think about who you’re making your show for. 21:00 Aaron: One of my listeners (Stan) reached out to me, and I wanted to do a review for him to give him some practical steps to help him write a better podcast description. I can’t take a look at his podcast description without looking at my own podcast description, so let’s look at my podcast description first, then Cory’s show (Invisible Details), then Stan’s show. I feel like I need to rewrite my description, so I’m hoping the things we talk about in this section will be helpful to someone else who has been listening who might want to rewrite theirs. 22:23 I don’t really like that first sentence. It’s making a claim that I’m a professional podcast editor and producer, but I don’t have any evidence to back that up. I’m not saying, “Professional podcast editor and producer for these people.” I do have evidence to back that up, and the people that know me know I’ve worked with some fairly well-known podcasters, especially in the design realm. The problem is this sentence makes a claim that I have authority but I’m not backing it up with evidence. Second, it puts me first—the first thing you see is my name, then I say I’m going to share everything I’ve learned. 23:17 Another mistake I’m making there is talking about myself in the third person. I want to speak to a single person and I’m not speaking to a single person until the second line. Cutting out the first and the last sentences would be a good place to start, because that puts the focus back on you, the listener. What do you want? Do you want to start a podcast? Do you want to grow an audience? This is the show for you. 26:24 I like it, but I think I could rework a little bit. There are a couple of things I’m trying to do with this. First, I’m setting expectations with “a weekly show.” There’s no confusion about when it comes out, like bi-monthly, or a seasonal thing. It’s a weekly show. Next, the description talks about building a successful brand. Most of the people I encounter who are starting this journey of building a better brand think branding is a out the visuals, logos, and all the things you see, but a brand is all about perception. It’s all about how people think and feel about you and what they say about you when you’re not in the room. 27:21 I could rework that second sentence, but I also want it to be introductory, because the people we’re trying to reach are people who have new and growing brands. They’re just getting that first taste of redefining what brand means, and that’s what that second sentence is for. 28:00 Aaron: You have a solid first sentence and a solid last sentence. Let’s say we cut all that stuff out in the middle; it would still be a good description—“A weekly show about building a successful brand through story and authenticity. Connect with your audience and stand out from the competition.” It explains what the show is about and what the listener will get out of it. 28:18 Cory: It’s very action-centered. I’m a very simplistic kind of person when it comes to design and writing. I adhere to this idea of, “How much can I remove but still have there be quality? Can we do less, but better?” That’s my whole philosophy. I know people who write out their whole about pages in their description and no one will read that or remember it. You need to create something that is short and memorable. 29:00 If someone asks if there’s a podcast about podcasting I’d recommend, I’d say, “If you want to make a podcast, the Podcast Dude is all about helping you make an awesome podcast.” That’s how I would describe it. Those are the ideas and key words you want to plant into people’s heads through the description in a very simple way that’s tangible and memorable. 29:55 Aaron: You can’t ask people to remember four paragraphs about you and what you do, because they’re not going to. If you can’t explain the point of your show in one or two sentences, you’re going to have a bad time. People already know what they’re looking for. Your description is there to let them know you have what they’re looking for. 30:25 Cory: People already know what they’re looking for. You need to demonstrate that you have what they’re looking for. 32:59 The description for his podcast is, “This podcast focuses on ministry leaders to reach maximum impact where they currently lead. We also focus on brainstorming and idea creation for leaders.” Cory, what’s your first reaction where you hear that? 33:21 Cory: It sounds like something I would read in an about page, not a home page. On a home page, you need to speak to the pain of the person who’s problem you’re solving and it needs to speak with a benefit. I see his goals, but I don’t see the benefit for myself. I want to know what I’m going to get out of going to this website. Condense that down to a single sentence—that’s what people need to see on the home page. 34:01 There’s a lot of things there and I’m sure Stan is awesome. In fact, I’d love to talk with him about some of this stuff. The problem is I don’t know Stan yet and all he’s doing is introducing himself. If I’m a leader and I want to have maximum impact wherever I’m currently leading, I want to know that you’re here to benefit me. That’s ultimately what people are trying to figure out when they first go to your site. You can bring in yourself a little bit later. 35:22 Aaron: Stan, what do you mean by “maximum impact”? I think that’s important, because those aren’t very specific words. If you want people to make a change, what kind of change are you trying to get people to make? Go a little deeper on what those words mean. Also, what specifically about brainstorming and ideas? What’s missing is a clear description of the problems you’re trying to solve for people. 36:06 Cory: The other aspect with that second sentence is, I see, “We focus on brainstorming and idea creation for leaders.” Does that mean you’ll brainstorm for me and give me ideas? Or are you trying to teach me how to brainstorm? Are you trying to give me the tools to have better idea creation? Are you trying to make me into the kind of leader that is able to lead a team, brainstorm, create ideas, have successful meetings, make an impact in our community? Those are the things I want to see and hear about. 37:31 Another thing you can do is if you’ve had a podcast for a while, you can go look at the reviews and see what people are saying in your reviews. From there, you can rewrite and clarify your description based on what other people are saying. If you’re a new podcast, you may not have that yet, but I would recommend talking with someone. Share everything about what your podcast is about and what your mission is and have them repeat it back to you in a sentence or two. That will give you some good ideas that you can include in your description. Have clarity in your podcast description. If you don’t have clarity, you have nothing. 38:15 Aaron: Talk to a couple of people you trust, or if you have an engaged online community, reach out to them and ask, “What do you think my podcast is about?” and see what people say. If you don’t have a podcast, try it for yourself instead. Ask some of your friends, “How would you describe me to someone else? What do you think I’m about?” You’ll get a lot of insight out of the answers to those questions. 38:52 Cory: Stan, I hope this doesn’t discourage you at all. The fact that you’ve shown up and have a grip on your mission and you know how you want to help people, that’s good! That’s more than a lot of people will ever have, but you just need to focus on clarity. Clarify some of the words and clarify who your target audience is based on this list you wrote. This is a great list, but try to condense it in a way that’s repeatable for someone you’ve just shared it with. You have to write for stupid people. Is that a terrible thing to say? 40:19 Aaron: It’s not just stupid people. People are in a hurry, in a rush, people don’t want to think. 40:28 Cory: Let me rephrase: You have to write in a simple way that’s tangible and clear for people. I often see people use inside slang, jargon, and terms that average people wouldn’t understand. Don’t give me the marketed, straight-from-a-thesaurus words. I don’t care about that. If I’m your intended audience, I need it explained in a simple way. You can deliver complex ideas simply with clarity. 41:50 Communicate in a simple but clear way. 42:43 Cory: I didn’t mean that people are stupid. You just have to write in a clear way that anyone in your intended audience can understand. That’s the most important thing. 49:41 Cory: First, what is the goal of your social media account? I don’t know that there’s necessarily a formula, but I know that a lot of social media descriptions have a cap, so you can’t write past a certain amount of characters. Write something that’s succinct and will help push you toward your goals. Especially now, try to make something that’s memorable beyond “Father. Coffee lover. Hiker. Mountaineer.” Everyone is doing that, so if you’re doing anything different, you’re in good shape. 51:25 Cory: Mine is, “Director of Member Success at seanwes. Podcast host of Invisible Details. Author of Nice-to-Have, currently writing.” It depends on what your goals are. I want my Twitter to be a place where people can get access to me and the content is not in the description, the content is in the timeline. 51:48 That’s where I want people’s eyes to look. I don’t want to be clever, I want a bullet point credential. That’s how I’m using it. Figure out what your goal is, what the goal of your social media account is, and what the goal of your description is. Then, condense that in a way that provides you some kind of credibility and people will continue going down the timeline. 52:18 No one is going to care on Twitter unless they’ve gotten some kind of value on your timeline, whether it’s entertainment, practical, etc. They’re going to go to your timeline first and then they’ll want to know about you. I use my bio as a tiny about page related to what it is I’m posting. 52:43 Aaron: You’ll get more followers if you include what you want to do for other people in your bio. 54:20 Aaron: Jeremy Mura has a good one too, “Designer and illustrator. Teaching others what I know and helping people design a life of greatness.” When I look at someone’s bio, I’m wondering, “Why should I follow this person?” Your bio is your chance to convince me to follow you. If I’m not already convinced, I don’t know you, and you don’t already have a huge audience advocating for you, and you don’t tell me what you want to do for me, I probably won’t follow you. Your bio is a chance to convince people they’ll get something out of following you. Huge thanks to Cory Miller for joining me today. Follow him on Twitter and check out his excellent podcast Invisible Details.